Little legacies, thought full food. This is a link up over at the Alexander Residence – hop over and read some of the other wonderful posts this week.. This weeks legacies from Kate and Penny brought tears to my eyes. I’m lucky enough to still have my Mum and reading these memories make me treasure that even more than I already do. My mum was very young when I was born. One of the great benefits of that is the wonderful opportunity this gave me to be close to my grandparents on both sides. In fact I also remember three of my great grandparents very well. The thing I love most about Penny’s legacy project is how it reinforces my heart-felt belief that the things I do everyday guided by my Granny’s voice in my ear are what keep her honoured and revered in my heart and make her alive to my children. She was a born instructor. A memorable, strong-willed vibrant woman. I’ve written before (and linked up here before as well) about all the tiny cooking rituals she’s seeded in me. Reading Penny’s post about sewing with her mum makes me think so sharply of our cooking lessons. I joined the cooking rota relatively early. My parents both worked full-time and my sister and I had chores to do when we got home from school. My mum had cooked for her entire family from an early age and could not see why I couldn’t be responsible for two dinners a week during my later years in junior school. At the beginning things were left for me to prepare with instructions but as time passed I had to look in the fridge or larder and plan from the (usually sparse) ingredients there. It was my Granny who showed me how. Standing in her kitchen with an apron cooking alongside her she wound me round with a steady stream of instruction, story and superstition. Pacifying spirits, making small helpings spread a long way, weaving magic with the cheapest cuts and mysterious innards, balancing health with spices, healing hurts with carbohydrates we passed the years. Every single day I do something in my kitchen that my Granny told me to never forget. Today I’m boiling butter beans for a bean bake and there’s a tomato in there with them. but I’ve done it without and it’s not as good. 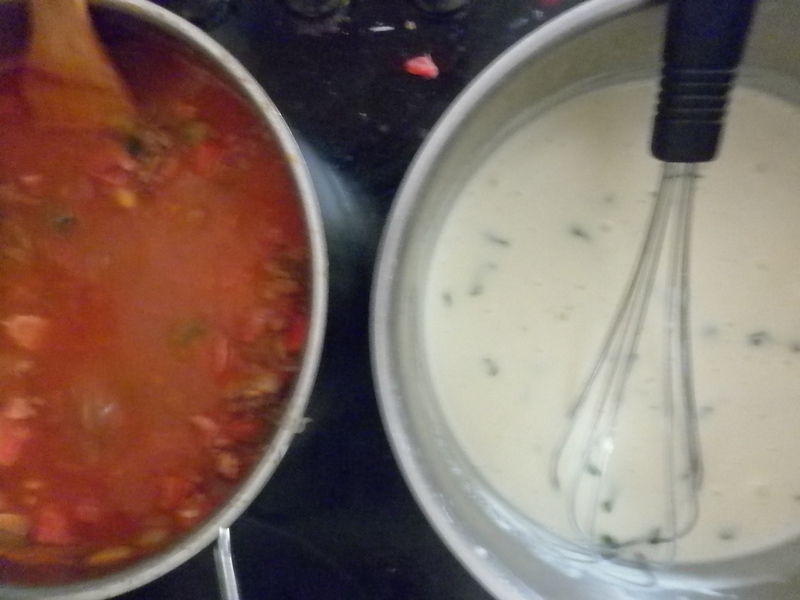 Always a splash of milk in with tinned tomatoes, cheaper the meat then the lower the heat, okra thickens better than cornflour, sniff the melon to see if it’s ripe, always, always put in the bone – that’s where all the flavour is. Cold hands for pastry, wet hands to make meatballs, if you add bread they go further and taste lighter. Always pass salt to the gods. Start meringues with a slice of lemon wiped around the bowl. Less is more for allspice and it numbs the heart as well as the tongue. A drop of vinegar in the water to poach eggs and if you put an apple in your potato sack it’ll slow the shoots coming. Dust your fruit to stop it sinking in cakes, salt smothers flame on a grill and always, always keep a crust and some cloves on your windowsill for good health and luck. You can always stretch a meal to welcome a guest, good hospitality is your honour and pride. Respect food, there’s literally someone dying out there for lack of it. Meals cooked with love say – I care about you, I have woven this with my hands and my knowledge and the best my purse could purchase and I offer it up, friend, loved one, to sustain you and bring you pleasure. Every time I look in my cupboards, fridge and larder and mentally juggle ingredients to conjure up a meal she’s at my shoulder. Truthfully I can’t think of a better way to honour her and her memory. To keep her alive in my life and for my children. Zeph already salts correctly. I find myself quoting her truths to him as we cook together or as he stands by watching. So it goes on. Soothing and familar. Small, everyday and earth shakingly, world formingly important. This entry was posted in Uncategorized and tagged Beautiful Things, cooking, family, food, happiness, little legacies, parenting, thinking. Bookmark the permalink. Oh Laura, this brought tears to my eyes. Your words are like sheet music, harmoniously composed, and you speak with such love. I am not in the zone to speak in this way about anyone in my family right now. I do hope that, over time, my heart will be softened once more and I will one day be able to take part in a project of this nature. Oh my goodness, you have the beginnings of an amazing cookery book here. Several of your posts on cooking have made my draw drop, your Granny clearly instilled you with so much confidence and so many great tips. Beautiful read. I am so glad you are passing it on to your children, but I so want you to write a book! You are definitely too kind! am chuckling away about the recipe book as everytime I go to write something we’ve cooked on the blog I realise how hard it is as I try to put everything into measurements (and fail!) I am thankful for the confidence – and that’s really from my mum for giving me the responsibility and trusting me to fulfil it. Thinking about that a lot recently as I’m trying to do more of it with Zeph. Really loving looking back at things with you all on this linky – thanks again, hope school is still going well. I love the description of your Grandmother. This is so beautiful, I can’t find the right words for a comment. I feel connected to my (recent) ancestors when I’m cooking, too. I’ve inherited most of my kitchen equipment from my mother and grandmother, and hope I never have to replace those things, but really, it’s the knowledge that’s the link, not the things. The smell of onion and celery cooking will always be my grandma’s kitchen, no matter how often I cook them. oh lovely – smells are so evocative aren’t they?